Scientists have been able to generate the world’s fastest laser pulse with a beam shot for 67 attoseconds (0.000000000000000067 seconds). This breaks the previous record of 80 attoseconds that was established in 2008. This could help engineers see extremely rapid quantum mechanical processes, like the movements of electrons during chemical reactions. The researchers published their findings in the journal Optics Letters. 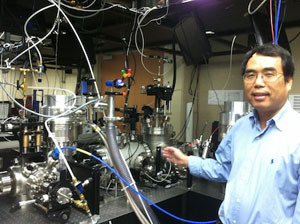 This will allow the study of electron motions with attosecond pulses. The blast was obtained by sending pulses from a titanium-sapphire near-infrared laser through a system known as double optical gating (DOG) in which the gate concentrates the energy of extreme ultraviolet light pulses and focuses them on a cell filled with neon gas. Light travels about 20 nanometers in 67 attoseconds, which is 400 times the width of a hydrogen atom. The wavelength of extreme ultraviolet light is 10-120 nm, which means that the pulse would have been exactly two waveforms at most. The pressure of the gas controls the duration of the pulse, which could mean that the team could achieve much shorter laser shots, as low as 25 attoseconds. At such timescales, previously hidden subatomic processes will become illuminated with a much higher resolution. 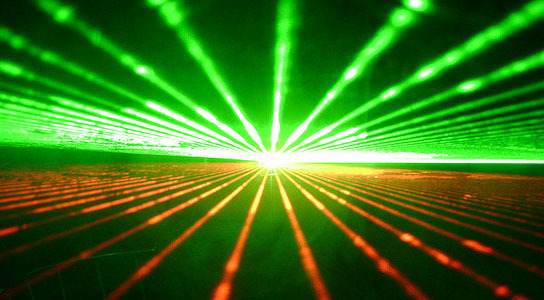 Be the first to comment on "Fastest Laser Blast – 67 Quintillionths of a Second"